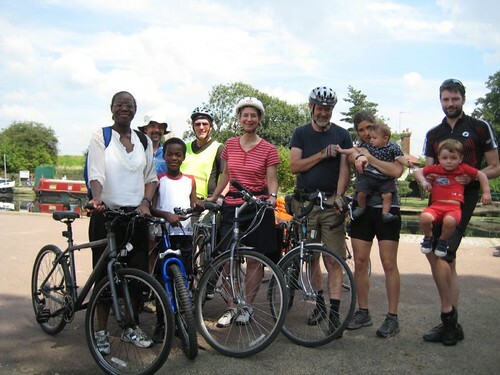 Eleven intrepid cyclists (well 9 cyclists and 2 passengers) headed for the Lea Valley on a pretty hot day via Victoria Park (coffee stop) and back via Finsbury Park (tea and ice-cream). James takes credit for the route. From left to right – Leslie, John, Edward, Clive, Ellen, Graeme, Natasha, Gwyn, Reese and Andrew. It was Gwyn’s first cycle ride!